My grandfather, Thomas Henry, had a great interest in ponies and indeed in animals of every kind. I am told that he was often called upon to advise or help when a neighbour had a sick or ailing animal. Veterinary surgeons were few and far between in those days and in any event you could be a long time waiting for one to arrive by pony and trap. In 1893 the Congested District Board offered a chestnut Welsh Cob stallion to George Lyons of Bunnakill but this animal was instead located with my grandfather at Tullaboy and named Prince Llewelyn . I do not know if the stallion was named when he arrived here but it was a common name in Wales and it is interesting to note that my grandfather’s mother, Sophia Griffiths was from Wales and one of my granduncles, born c.1870, was named James Llewellyn Lyons. Thomas Henry would have been 26 in 1891 and had a number of good Connemara mares. Dynamite and Powder were two of the offspring of these and both were sired byPrince Llewellyn . Dynamite was chestnut in colour and was a famous trotting pony. He was the sire of the famous Cannon Ball and won many prizes for style and action before being sold to a wealthy American for £100. I understand that my granduncle, James Llewellyn accompanied Dynamite to New York travelling from Cork aboard the SS Umbria on 16th October 1904 (the year in which Cannon Ball was born). He arrived at Ellis Island, Port of New York on 22nd October giving as his destination 225 East 77th Street, New York City and the name Thomas Stark. Some time later he continued on to Pittsburg, where he married Margaret Reynolds in 1910 before moving to Sacramento and joining the fire department there. He never returned to Ireland. His only surviving son, Edward lives in Sacramento as do various grandchildren and great-grand children. My grandfather was present at the public meeting held in Sweeney’s Hotel, Oughterard (now the Corrib Hotel) on December 12th 1923 and was an active member of the provisional committee of the Connemara Pony Breeder’s Society which was set up at that meeting. He was elected as a member of the first Council at the General meeting held in Galway on 31st May 1924 and is seated on the left of the front row in the photograph which appears in the first stud book published in 1926 and which is reproduced on page 21 of Elizabeth Petch’s book the Connemara Pony Breeders’ Society 1923 – 1998 . In the summer months it was common to milk the cows out in the open. This practice continued until quite recent times when people in this part of the country decided to give up milking and take advantage of suckler- herd subsidies from the European Union. Since cows could walk over a wide area during the night and early morning you might be walking for a good while before finding them. It could be difficult at first to get the cow to stand still but whenever you got started, the massaging of the teats seemed to encourage her to remain stationary until the mission was accomplished. It was while milking a cow in such circumstances that my grandfather died of a heart attack on Wednesday 17th July 1935. I understand that he was quite popular locally because of the fact that he was good at looking after sick animals and consequently a number of Roman Catholics decided to go into the church for the funeral service. In so doing they had committed what was known as a ‘reserved sin’ and were obliged to go to see the bishop afterwards. I have already mentioned Cannon Ball, son of Dynamite. Cannon Ball was foaled in 1904 and when fully grown was 13 hands and 3 inches tall. 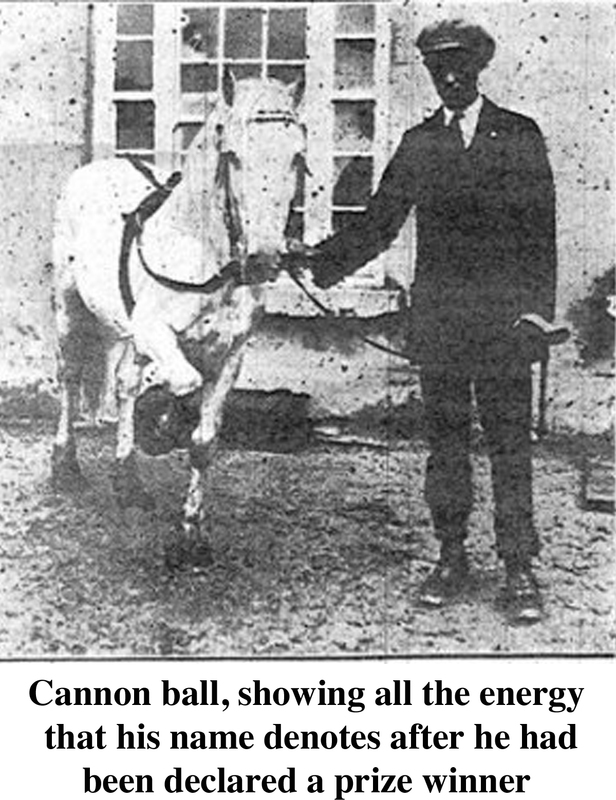 He is the first stallion appearing in the Connemara Pony Stud Book published by the Connemara Pony Breeders’ Society in 1926 and was owned by Harry O’Toole an uncle of the late Cóilín O’ Sullivan of Leam. Harry O’Toole was known as Honri and he owned a thatched pub in Oughterard. It is said that both he and his wife had a liking for alcohol and, when too much had been consumed, other customers would fill their own pints and leave without paying. The premises were bought by William Keogh (a Land Commission Inspector) for £200. William Keogh married a sister of the late, Mike Power’s father and the Keogh family still run a Bar and Supermarket on the same site. Having sold the pub, Henry O’Toole and his wife moved to Leam. 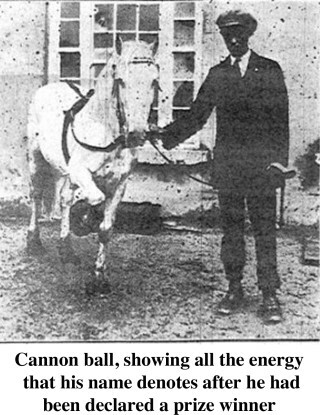 On Saturdays, Henry and Cannon Ball would travel to a market in Athenry. For a fee of ten shillings, mares would be covered at various points along the way and the famous stallion would often find his own way home late in the evening with his owner asleep in the trap. 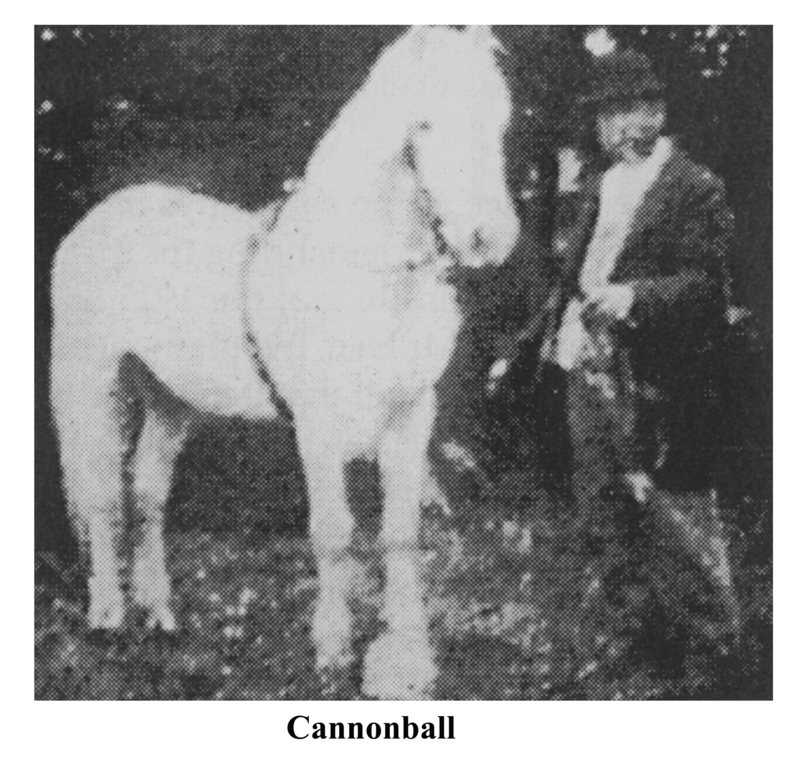 Cannon Ball took part in pony races in Oughterard and elsewhere and was never beaten. He once raced the train from Oughterard to Leam and was waiting there when it went past. No more with earthly kin you’ll mingle. And bookies left without a jingle. I have been told that when Henry O’Toole himself died there was no drink at the wake and, as the O’Tooles had no children, the house and land passed to a nephew, Cóilín O’Sullivan whose son, Colm, farms there today. He once showed me the resting place of the legendary stallion with a white thorn tree marking the spot. Colm keeps a stallion and several mares while his brother John who lives nearby also has a keen interest in Connemara ponies.